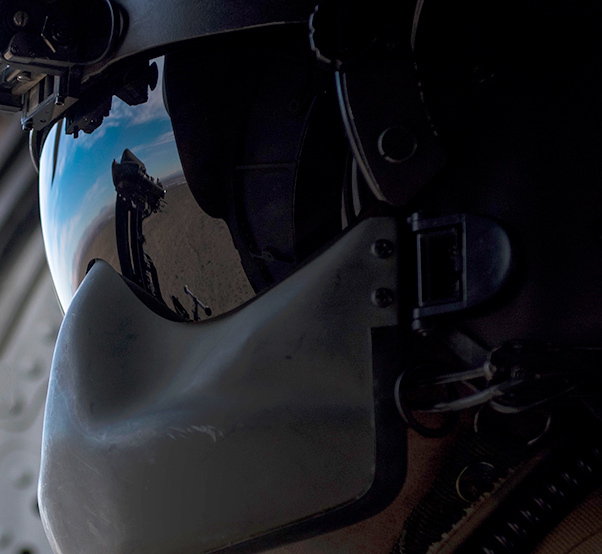 An Airman, assigned to the 66th Rescue Squadron, looks out the side window of an HH-60G Pave Hawk helicopter during training on Nellis Air Force Base, Nev., Feb. 22, 2018. 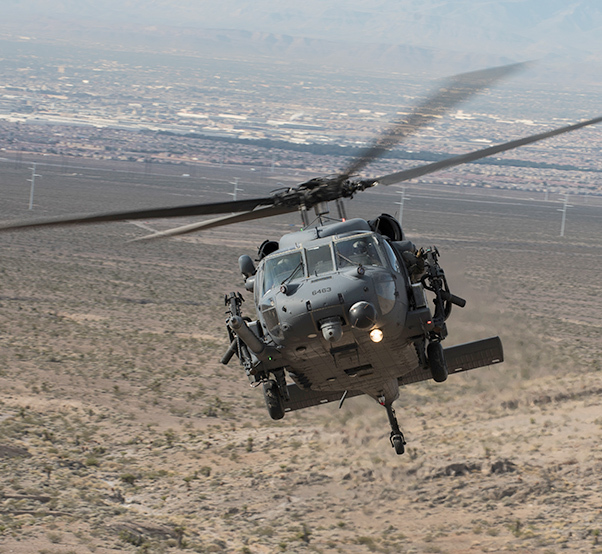 The HH-60G Pave Hawk helicopter conducts day or night personnel recovery operations in hostile environments to recover isolated personnel during war. A pararescueman is hoisted into an HH-60G Pave Hawk helicopter, assigned to the 66th Rescue Squadron, during training on Nellis Air Force Base, Nev., Feb. 22, 2018. The mission of the 66th Rescue Squadron is to provide rapidly deployable, expeditionary, and agile combat search and rescue. 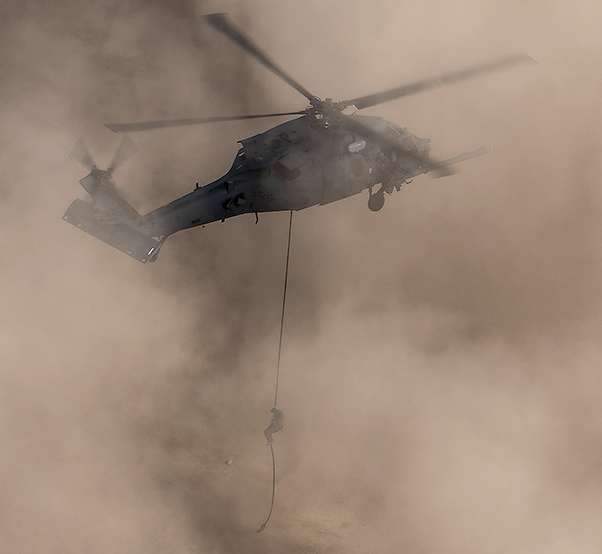 A pararescueman repels out of an HH-60G Pave Hawk helicopter, assigned to the 66th Rescue Squadron, during training on Nellis Air Force Base, Nev., Feb. 22, 2018. Pararescuemen are highly trained experts who perform rescues in every type of terrain and partake in every part of the mission. From search and rescue and combat support to providing emergency medical treatment, parerescuemen ensure every mission is a successful one. 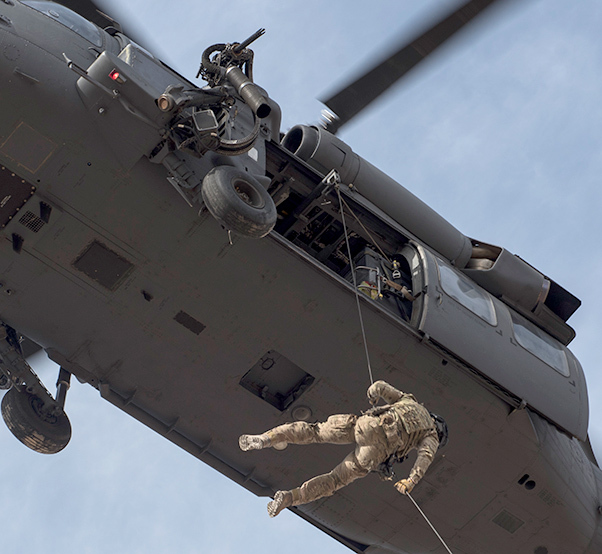 A pararescueman rappels out of an HH-60G Pave Hawk helicopter, assigned to the 66th Rescue Squadron, during training on Nellis Air Force Base, Nev., Feb. 22, 2018. The Pave Hawk is a twin-engine, medium-lift helicopter operated by Air Combat Command, Pacific Air Forces, Air Education and Training Command, U.S. Air Forces in Europe, Air National Guard and Air Force Reserve Command. An HH-60G Pave Hawk helicopter, assigned to the 66th Rescue Squadron, flies during training on Nellis Air Force Base, Nev., Feb. 22, 2018. The HH-60G is tasked to perform military operations, including civil search and rescue, medical evacuation, disaster response and humanitarian assistance. 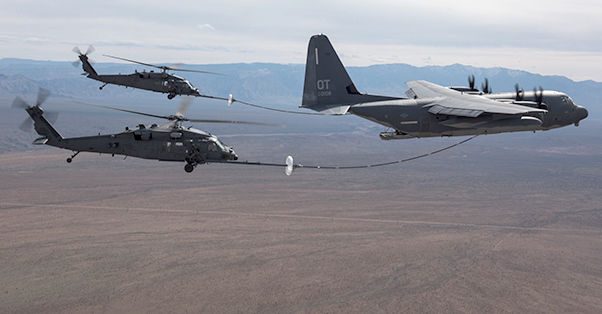 A pair of HH-60 Pave Hawk helicopters receive fuel from a HC-130J Combat King II cargo aircraft during a training mission over the Nevada Test and Training Range Feb. 22, 2018. 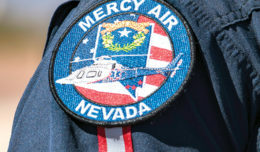 The HH-60 is the primary search-and-rescue helicopter for the Air Force, and can also be tasked with disaster and humanitarian relief missions. Airmen sit on the ramp of a HC-130J Combat King II cargo aircraft during in-air refueling over the Nevada Test and Training Range Feb. 22, 2018. The HC-130J can rapidly deploy to execute recovery operations to airfields and denied territory for expeditionary, airdrops and helicopter air-to-air refueling. 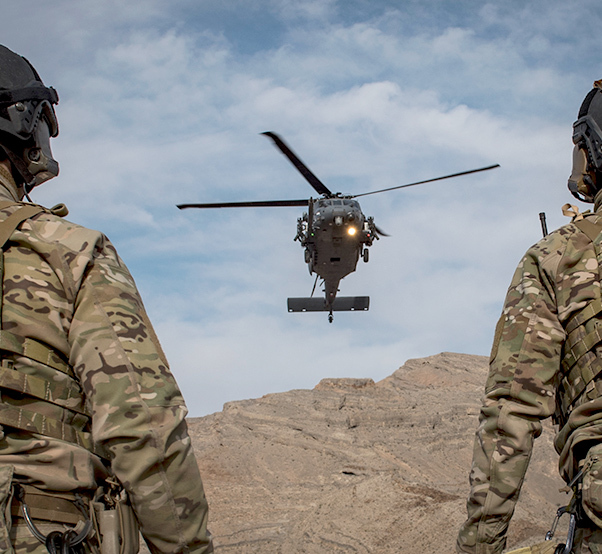 Pararescuemen wait for an HH-60G Pave Hawk helicopter, assigned to the 66th Rescue Squadron, during training on Nellis Air Force Base, Nev., Feb. 22, 2018. 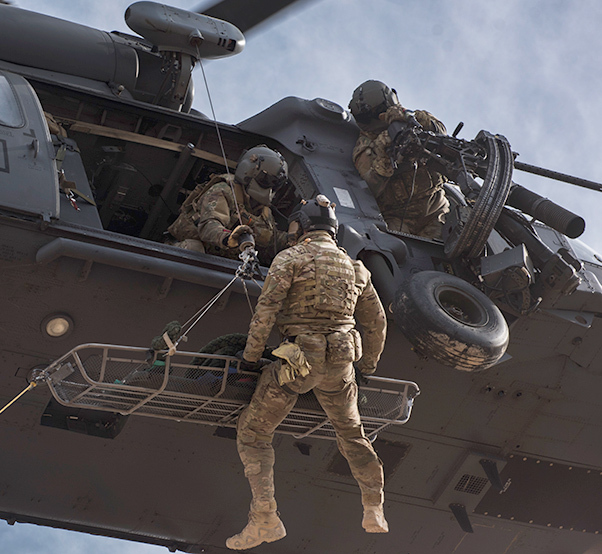 Pararescue specialists rescue and recover downed aircrews from hostile or otherwise unreachable areas. 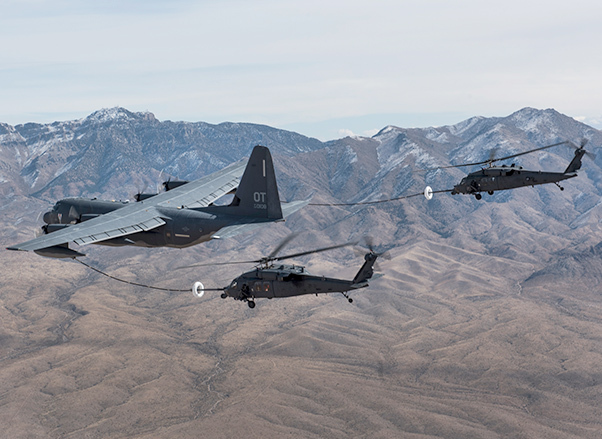 A pair of HH-60 Pave Hawk helicopters receive fuel from a HC-130J Combat King II cargo aircraft during a training mission over the Nevada Test and Training Range Feb. 22, 2018. The primary mission of the HH-60G is to conduct day or night operations in hostile environments to recover isolated personnel during war. 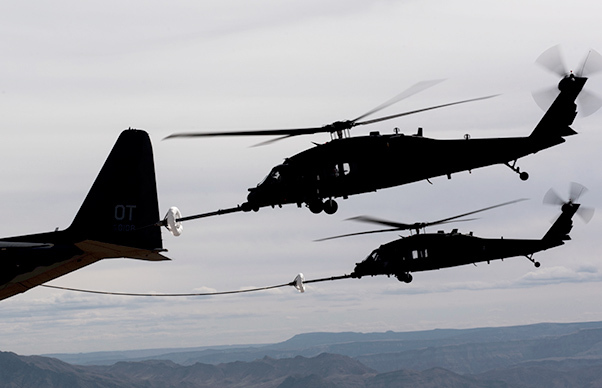 A pair of HH-60 Pave Hawk helicopters receive fuel from a HC-130J Combat King II cargo aircraft during a training mission over the Nevada Test and Training Range Feb. 22, 2018. 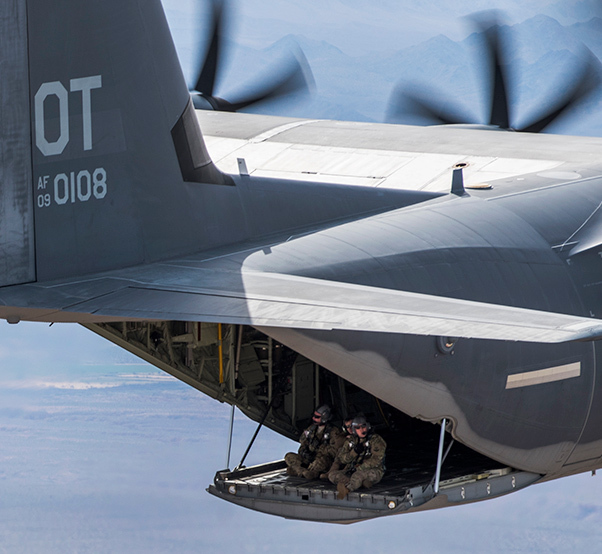 The HC-130J is designed to conduct personnel recovery missions, provide a command and control platform, in-flight refuel helicopters, and carry supplemental fuel for extending range or air refueling.